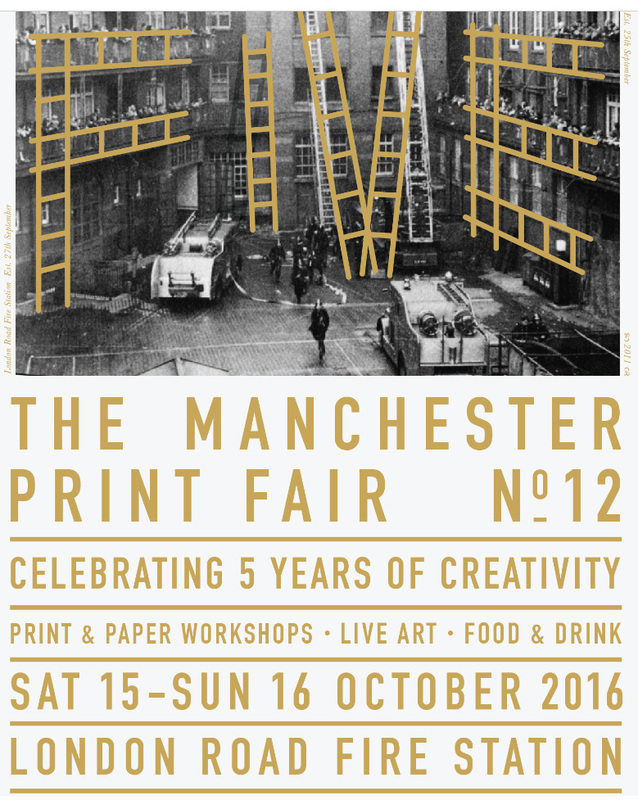 On the 15th October I will be selling a selection of my illustration prints/ cards at the Manchester Print Fair. Come on over and say hello if you’re in the area! Thank you to everybody who came to see me at the Summer Arts Market at St George’s Hall, Liverpool, at the weekend. It was fantastic and lovely to meet lots of new faces too. Left over stock from the weekend will be making its way into my Etsy shop sometime next week. I am hoping to overhaul my website this summer/autumn so that everything will be up to date and relevant to my current work. 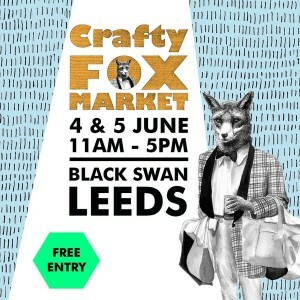 On the 4th June I will be at the Crafty Fox Market in Leeds selling my spun cotton characters and a selection of my prints! It is the first time I have ventured out of Merseyside with my work so it’s all a bit exciting. I’m already busy making new work for it. 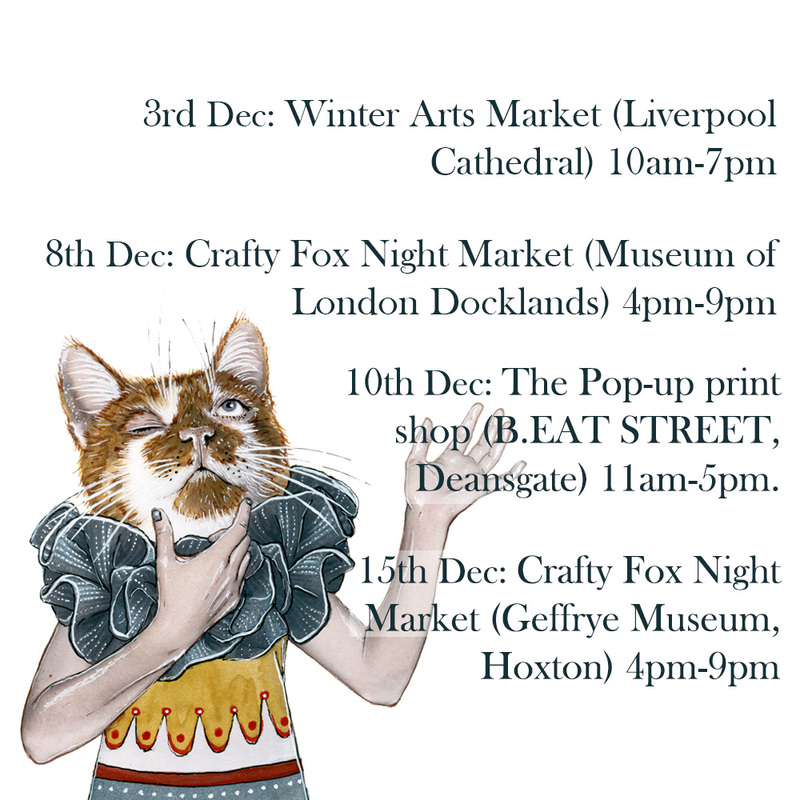 Come and visit if you’re local to the area, would be great to see/ meet you! If you can’t attend there then I will also be at the Summer Arts Market at St George’s Hall, Liverpool, on the 25th & 26th June. 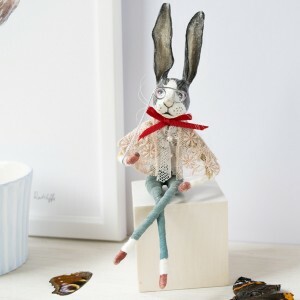 Just want to update you all, I will no longer be selling my handmade items upon my notonthehighstreet.com shopfront. 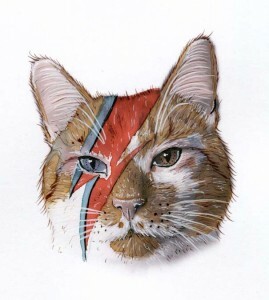 Etsy is now the home of my handmade work! Please find my store here. My illustrated tribute to David Bowie, such a huge loss from this world. I will be making this print available for purchase very soon! I have been lucky enough to make it into the news section of the December/xmas issue of Period Living!The magazine is out now. My spun cotton goose, featured, has been snapped up quickly. But do not fret, I am adding new geese into my notonthehighstreet shop towards the end of next week so keep your eyes peeled. A wide range of my hand made Christmas decorations, made from felt and others from wood, are now available to purchase from this famous store! A select few are available to buy from their website. Be quick though, my little felt characters are nearly a sell out! 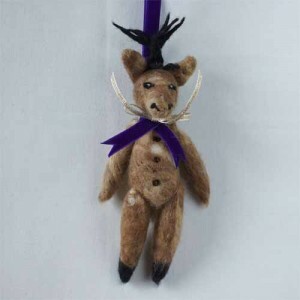 You can find Tommy Bramble the rabbit, Edward Elder (pictured) the reindeer, Vincent Cinnamon-top the Fox and Victor Thimbleberry the Badger. 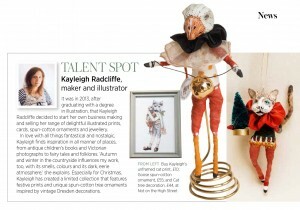 I have also a limited edition of giant needlefelted characters, Paisley Pepper the Cheetah and Timmy Treacle the Tiger. I am off to see them this weekend to get some snaps of them in situ! Apologies for my lack of posts. I have been a busy bod working on new decorations for Christmas, many of which will be available at my upcoming fairs: 28th/29th November at the Palm House, Sefton Park, Liverpool. 5th/6th December at St George’s Hall, Liverpool. I also have work on display at a Christmas Old and New art exhibition at Brockholes, Preston, which is open until January. 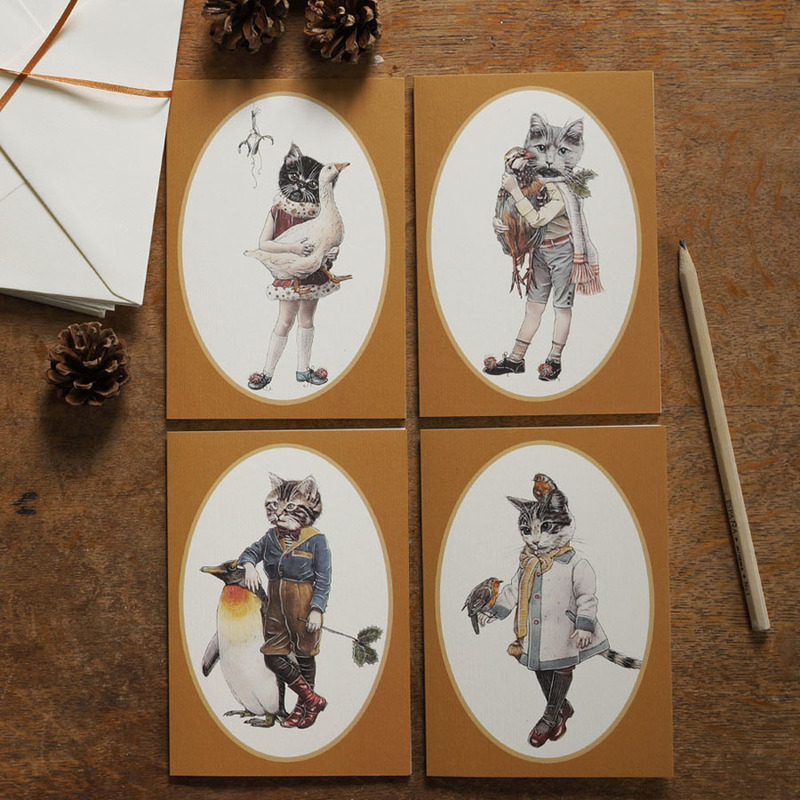 Christmas cat cards, which I mentioned in my previous post, are now available to purchase from my notonthehighstreet.com shop which can be found here. 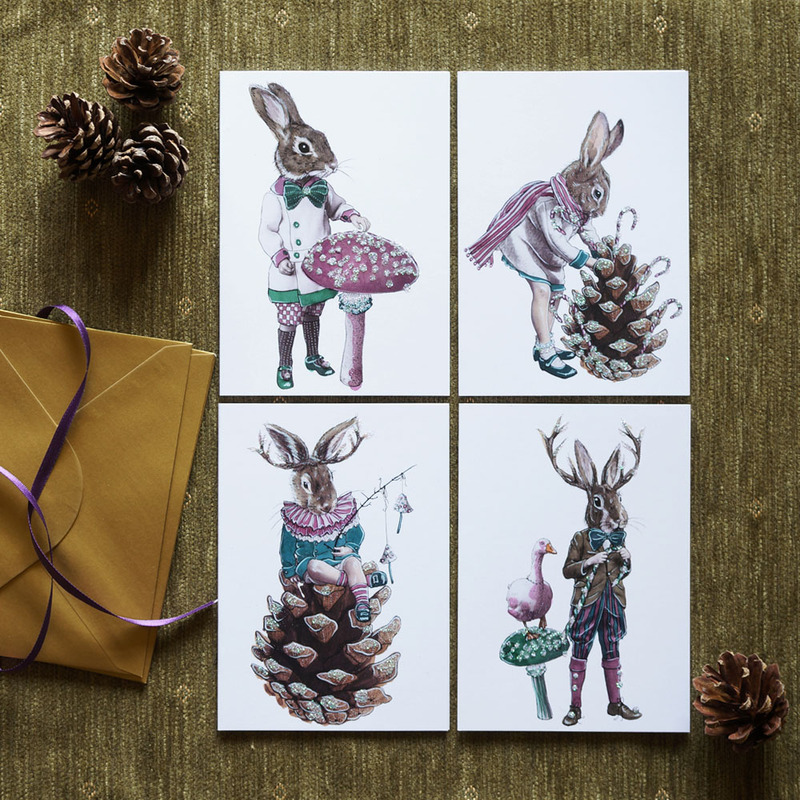 I have a range of beautiful Rabbit Christmas cards too, the designs of which were used upon Christmas descorations I designed and made for Harrods last Christmas.